I have been looking at getting one of these, what are your thoughts on them? Cool, expensive range toy. Nothing more, nothing less. I want one or three! My favorite platform is the 1911. So a 1911 platform that holds 15 plus one in a G19 size which is also my other favorite is a no brainer. Perfect. Except I just bought a Nighthawk T3 in 45 which is also perfect. If you want it cause it's cool, get it. If you want it to enhance your ability to defend yourself, it won't do anything a Glock won't do, really. It just does it with more class. Just be honest with yourself. I have two WC Berettas and a gold leaf covered P210 Legend in the safe cause I thought they were cool. Wilson had the Spec Ops 9 in their lineup for a while. That's been gone for a few years. I have to wonder what the availability of proprietary parts will be? Granted, they are quality from the get-go. Considering that it is a relatively low volume, specialty product. I know that Wilson has one of the best warranty policies in the business, but what is the likelihood of them keeping the small bits and bobs in inventory a decade down the line? I have a feeling that the 3k price tag is going to be too high a price of entry and that it won't sustain itself beyond a few years. *full disclosure* This is coming from a Wilson owner. But true 1911 parts are ubiquitous. There was a thread about this pistol's announcement a few months back that went for a few pages. Opinions were all over the map, as one might expect. My take-away was "if you can afford it, you can consider it, and if you can't, then don't." If you carry an Ed Brown or a Nighthawk, you may be the targeted consumer for this pistol. I say this with zero sneer or snark, also. Just seems like one of those nice pieces of equipment with an appropriately high entry cost. My Mazda gets me everywhere, but I could also do it with a Bugatti if I could afford it. Since I can't, I don't, but I'm not mad about it. That kinda thing. No reason that it couldn't be personal choice for carry. I have one on order. Looking for it to be in my hands late summer. This will more than likely be my new EDC gun. I have handled one, but have not shot one yet. Really looking forward to getting it!! Einstein defines insanity as "Doing the same thing over and over and expecting different results"
I played with one at the NRA show and it's just too busy for me looks wise. I actually was more impressed with the compact STI DVC which was about $1000 less and had a better trigger. If it were me I would get the new DW all Stainless 9mm CCO. Beautiful pistol, but in all seriousness, you could buy 5 Glock 19's plus 1,000 rounds of ball for what one of those costs. 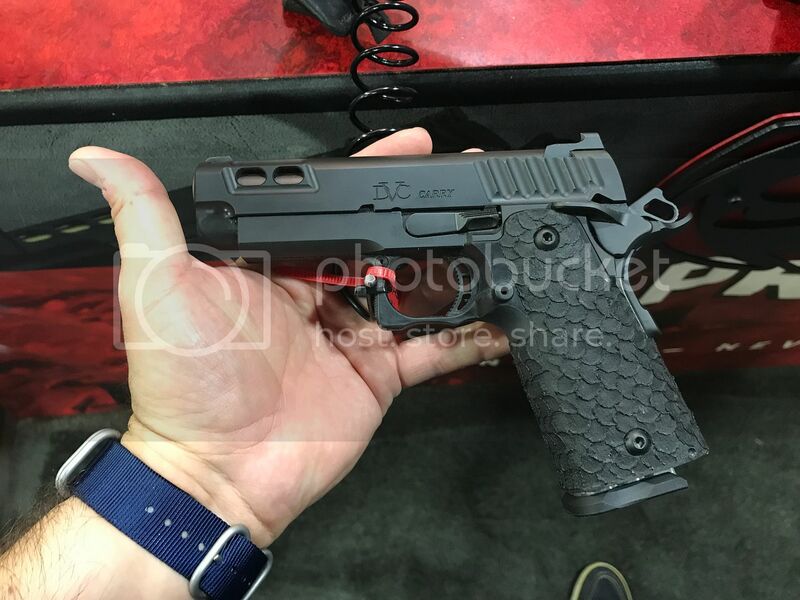 Who's gonna drop $2,895 for their EDC pistol? I looked at the STI DVC Carry and the STI COSTA V.I.P., but I hate the grips on them, that is what pushed me more towards the EDC X9. I have a couple Les Baer's, Kimber, Colts, Springfield, and was looking at buying a SVI when the Wilson Combat became available. CCO is a nice gun but I want a double stack, I did buy a CMC flat trigger to try out in my G19. I do have to say that the EDC X9 reminds me a lot of a Beretta 92, obviously until you get to the slide. 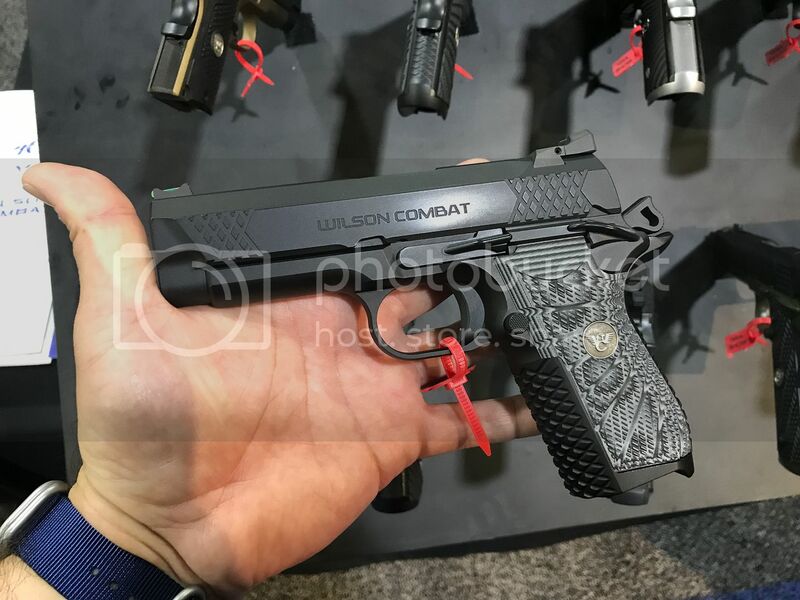 Wilson Combat Beretta 92 Custom Carry is a really nice gun as well would love to try the trigger. I have not shot an EDC X9 but I did get to handle one a couple months ago. It's really nice and is the best of its kind out there in my opinion. From what I've gathered Wilson is at full capacity on building these. Something like 8 months to wait for one now. They are and will sell a boat load of them. I was at a match last weekend that CZ helped sponsor. I was able to put a few magazines through a CZ P-01. It was very nice. It's a decocker only set up. The DA was butter smooth with no stacking and a clean break. The single action was also very nice but had a little roll to it which I happen to like. It was extremely accurate. As accurate as anything I've shot including custom 1911's. This was a bone stock out of the box demo gun. They're around $500 and magazines are priced reasonably. The only thing I would do to one is sights and G10 grips but that's just personal preference. The size and profile is very similar to the EDC X9. It would be well worth a look if you want something in that size that has a metal frame. Looks cool and probably a great shooter. I could spend that type of $ on a few other items first though. For that amount of dough, I'd get two of their tuned Beretta 92G Brigs. It would be a nice, useful gun for $1000. But as it is, for that money I could get a single stack 9mm, a compact 9mm or .40, and full sized .45, and an AR. This could be done with guns from several name brand manufacturers. The handguns wouldn't be as pretty or as high craftsmanship. But they would work, and have a lot more utility. I would love to have one. However, I usually keep a duplicate of my primary pistol. Just this fact alone would make it very difficult for me. I definitely think Wilson nailed the size, control, ergos etc. I don't necessarily think of the "X" amount of other more affordable pistols I could get for the price of one WC X9. But the amount of shooting I can do for $2800 worth of ammo, reloading supplies etc. makes it a hard sell. If money wasn't a limitation I would at least have one for the awesome factor. bubba, what gives? No love for a 2011-type 9mm? Even with the right kind of blood transfusion, like I said before in the earlier thread it's too rich for my veins. Particularly for EDC. $3000 for a range toy--even a supremely nice one--is tough enough for me to justify. But spending an additional $3000 for a EDC backup to the primary PLUS whatever a cache of 12-15 additional specialized magazines unique to this model are going to cost plus spare parts, assuming WC is even willing to sell any...yeah, definitely feels ridiculous given my simpleton background. And if I were to actually follow my pattern that I use with my actual EDC--the much more pedestrian G23--there would be TWO spares. WC may insinuate that this newbie is just as reliable as any Glock; if this is so then why honestly should I cut it any more slack than what I do with my EDC from the middle of Europe. I'm waiting for mine now. I was told about 7-8 months wait. It's the gun I've been wanting for a looooong time. An uber reliable double stack quality 9mm 1911. I tried an STI Guardian and it was absolute garbage! I fought with STI for about 8 months until they finally refunded my money. I like BHP's, but they aren't built for high round count of +p ammo and it's still not a 1911 trigger. There are so many funny things people say about guns like these; many are in this thread. "It's a range toy" that's hillaruous! Why is it a range toy? That litterally made me chuckle. It a built/designed to be a carry gun. Mine will absolutely become my primary carry gun. "I could buy six Glocks for that price." Great, buy six Glocks. I don't want six Glocks, I want an EDC x9. Besides, I already have 8 Glocks, what will I do with 6 more? "It won't do anything (insert gun here) won't do." Well, it's a double stack 9mm 1911 made by Wilson, (gun you inserted) isn't that, so yeah, it's everything that gun isn't. Essentially, the haters are people who don't have the funds to drop on one, but really want one imo. They're pissy they can't buy such a great gun and, imo, say this silly stuff as a result. There are premium products in every line of goods. Cars, clothes, food, houses, furniture, golf clubs...guns.. This is a premium product. To deny it's superior to base products is just silly. It's better, period. If you don't clearly see that, you don't understand what makes it a premium product. Is the price worth the better? That's up to you. If you've got enough cash in the bank to blow $3k on the gun without stressing, I think you'll find it to be worth it. If you've gotta stress and strain to afford the gun, you'll probably find it's not worth it to you. That's what it boils down to imo. I can't wait to get mine! I'm gonna shoot the crap out of it and carry it. It's gonna get dirty and scratched...and I won't care one bit. I can afford anything I want as far as guns go so that's not an issue. Just can't see where it's worth $3,000. I've shot $3,000 1911's before. Didn't shoot any different that a $1,000 1911 with a $150 trigger job. Assuming people are too poor to afford something just because they don't see the value is something is kinda crappy. I wrote a check for my new Tundra last year. Wrote a check for my wife's new car the year before. I can afford a $3,000 pistol if I can see the value. I can't.